The Walker Cup is a biennial event pitting the best amateurs from the U.S. against Great Britain & Ireland. It was first played in 1921 at Royal Liverpool. The event was originally played on even-numbered years, but switched to odd-numbered years after World War II. The Walker Cup is named after George Herbert Walker, President of the USGA in 1920 and great-grandfather of George W. Bush. While the U.S. leads the all-time record 35-9-1, the competition has been much closer since 1989 and each team has 7 wins. The Walker Cup serves as the Ryder Cup of Amateur golf, and earning a spot in the competition is one of the biggest honors an amateur can receive. Unlike the Ryder Cup, there is no “points list.” Instead, each team’s captain makes all of the selections for the team. Each team has 10 players, and the contest is played over two days in Mid-September. Each day consists of foursomes matches in the morning and singles matches in the afternoon. Overall, there are 26 points available, with 13.5 needed to keep the cup and 13 needed to retain the cup. This is the most prestigious event in amateur golf. Being selected to the Walker Cup team is an honor that players carry for the rest of their careers. Many of the biggest stars in golf have competed in the event, including Jordan Spieth, Phil Mickelson, Bobby Jones, Francis Ouimet, Harvie Ward, Tiger Woods, Jack Nicklaus, Rory Mcilroy, Sandy Lyle, Colin Montgomerie, Justin Rose, Pádraig Harrington and Luke Donald. The Walker Cup typically visits the best courses on both sides of the Atlantic. In 2017, the event will be held at Los Angeles Country Club and it will only get better from there. The USGA recently announced the next two venues for Walker Cups in the United States, Seminole Country Club (2021) and Cypress Point Club (2025). Across the pond, the R&A has secured Royal Liverpool for the 2019 Walker Cup and it’s rumored that the 2023 event will be at Carnoustie. With less logistics and smaller crowds than the PGA Tour or even Web.com Tour events, this opens up opportunities to play at the best courses that the United States, Great Britain and Ireland have to offer. These great courses and talented amateurs make the future bright for the Walker Cup for years to come. The 2017 Walker Cup will take place September 9-10th, 2017 at George C. Thomas’ masterpiece, Los Angeles Country Club’s North Course. Consistently ranked among the top 50 courses in the world, LACC’s North Course was completed by Thomas in 1926 and was recently restored by Gil Hanse in 2010. The Walker Cup will serve as a good warmup for LACC, which was selected as the host of the 2023 U.S. Open. The last major event held at LACC was the 2013 Pac-12 Championship, which was won by California. The winning team score for that event was +6, with Max Homa winning individually at –9. Only 10 players make the squad, with 2 of the 10 spots going to mid-amateurs (amateurs over 25), making competition intense for the final 8 spots. The U.S. team will be captained again in 2017 by John “Spider” Miller. University of Illinois' Nick Hardy. The U.S. Team is by no means set in stone, and there is plenty of time for this list to change before selections are made in late spring of 2017. Love golf? Sign up for our newsletter sent every Monday, Wednesday and Friday and stay up to date on everything happening in the golf world in just a couple of minutes each week. Paulie takes a deep dive into last year's stats to uncover a couple players he expects to have a big 2018. The hole at the Shell Houston Open that sees the most variety in play is the short par 4 12th. Take a deep dive into the hole and how its pin position affects how players play the hole. As golf heads into the final sprint before the Masters, here are the storylines to watch leading into the tournament. Looking for some guys who could make a leap in 2017? Look no further than these 10 names. 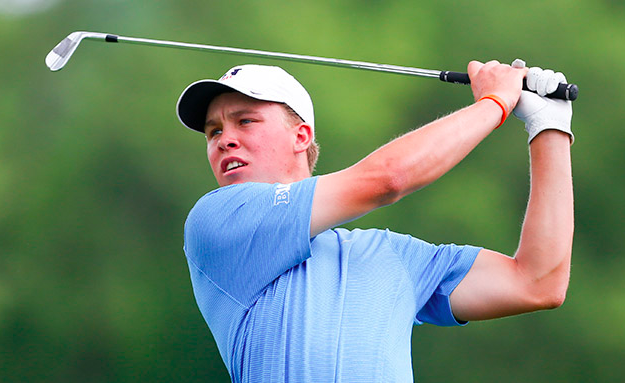 Check out who are the likely candidates to be golf's next crop of stars. Some have arrived like Jordan Spieth while others are just getting to the show. Special contributor Kyle Nathan recalls his experience caddying for Tiger Woods in 2000. With fall in full force and winter ahead, here are some good golf reads to keep your mind on the game. The story of my experience at the 2016 U.S. Mid Am. After a decorated amateur career and early success on the PGA Tour, David Gossett appeared to be headed for stardom but where is he now? A look at the career of former teen phenom Ty Tryon.